Ludo paused only for a moment as he saw the snake but as the snake hissed in confusion at Hasan’s words quickly resumed his climb up the chasm moving out of strike range of the snake. At the top he pulled himself up and over the ledge and with a few flicks of his wrist secured the rope around a stout branch. Leaning over the edge he gave the thumbs up that all was well and waited for the group to climb up one by one. Feldard watched as his companions climbed/ got hauled up by the rope and waited, alert below. Thus far the only dangers this day had been natural predators but he knew others things lurked in the mountains. When it came to his turn Feldard tied off the end of the rope to his belt and began the long arduous climb up. Stephan secured his gear and followed the others up when his turn came. The exposure on the cliff face was none too pleasing but his stalwart nature saw him to the top. Eventually, all of the adventurer’s were back at the top of the gorge and able to continue on their way. The rest of the day was spent navigating the ancient road as it climbed through the mountains, through rockfalls and narrow passes. It was getting close to nightfall when, after rounding a bend, the road ended suddenly at a sheer drop above a gorge. On the far side, a rock wall bars the only way forward. The wall is pierced by a pair of large stone gates, but the spans of the bridge which once led to them have long since collapsed. All that remain are a rank of jagged stone pillars which rise from the depths of the gorge. Ludo thought investigating the cave asked for trouble, we still need to get across the gorge, I will climb back up, grab the ropes and make my way across and secure them to the top so you can all make your way up the cliff with a safety rope to guide you. With that he started climbing. Stephan put his light stone away. He was not at all unhappy to leave the cave alone. He was impressed at Ludo’s easy ascent. The rogue hardly used the ropes! Meanwhile, Hasan seemed to be “at one” again with some rock beetle that had emerged. Stephan approached to see the insect but quickly saw that his presence was not welcome. When the beetle made a buzzing sound, Hasan turned to see what it was and saw the woodsman. The look on the elf’s face sent Stephan away. He then surveyed a hundred foot perimeter noting a variety of interesting rocks. He attention was divided, however, as he kept track of Ludo’s progress. The rogue was halfway up the chasm, when suddenly he heard the rattling sound. He turned his head to see a large rattlesnake headed right for him. There was no way to avoid it. He would have to defend himself with one hand while holding onto the rockface with the other. Hasan smiled in triumph. “It is Nature’s nature for an animal to coexist beside another. And we and this wonder shall too. I will never forget this day.” The elf’s eyes shined as he returned the forgotten-empty potion to his pack. “I hear the birds more clearly than ever. This canyon is blessed with life. Tell me, little one,” the elf whispered to what Stefan saw clearly as a rock, “how long have you lived here? What have you seen of the rim above?” The rock shifted and a much smaller cousin of the great Tuatara uncoiled and stared, apparently meaningfully, at the elf. The elf listened, rapt with attention. Two steps later, the elf noticed a hare. As the party crossed the small, slow moving stream in the center of the canyon, the elf noticed three brown trout. As they approached the canyon’s opposite side, Hasan became preoccupied with a sparrow. Each visit occupied the elf completely. The mage fumbled for his light-stone and waited at the cave mouth for the sturdy warrior. Stephan relaxed but did not sheath his sword. “Da. There’s that!” He turned to look up at Feldard. The dwarf, as yet, seemed disinclined to lower his crossbow. Stephan took a good look at the lizard’s tracks to learn the pattern. He noted the tell-tale drag mark of the tail and dewclaw marks. Following the tracks, he sidled over to the cave entrance and got out his light stone. He waited for the others to be ready to enter the cave. It seemed to be the logical next step. Feldard watched the giant lizard head back to its cave. He didn’t know what the elf had done but whatever it was it seemed to work. With the others down below waiting on him, Feldard wasted no time in starting down. He clambered down the wall, the safety rope running through a strap loop leaving his hands free to scale down the cliff face. No easy task. Reaches that were at hand for the others in the party were near impossible stretches for the short limbed dwarf. In fact, twice, the reach was impossible and the dwarf had to trust the rope entirely and swing over to a better vantage along the cliff. Only his skill in caving made the journey at all possible. Delving into deep underground caves was not all that different than scaling down vertical cliffs. At the bottom, Feldard freed himself from the ropes and frowned at the necessity of leaving them behind. He was quick to redress in his armour. Who knew what dangers might lay ahead. Feldard, from far above, saw the lizard emerge from cave. He gave a bellowed warning to those below while he pulled free the crossbow he had just finished strapping to his heavy pack in readiness for his own descent. He cussed in dwarven at his uncharacteristic attempt at efficiency, as he hastily loaded his crossbow. The dwarf could hear faint shouts from below as he watched his companions meet the creatures attack. Even with his crossbow ready now, there was little he could do without risking hitting one of his own. His aim was not that good. 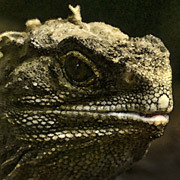 The giant Tuatara immediately stopped in his tracks. The elf had its full attention. The elf stopped, about 30 feet from the lizard, and leaned forward. Hasan addressed the lizard insistently, “Great one, know that we seek only passage, and that we shall not tarry. Let us travel onward. Return to your watch. Go home.” The elf pointed to the cave, hoping the profound magic of animal control he sensed in the gnollish potion would extend to the great beast before them. But the elf readied the words to levitate himself beyond the lizard’s grasp, in case it didn’t. Stephan raised an alarmed eyebrow at the elf’s actions and words. Nevertheless, he obeyed Hasan allowing for the seemingly remote possibility that the lizard would buy the elf’s saccharine ploy. Ludo flicked out his sword. He was prepared to dive to one side should the creature charge towards Hasan. Perhaps it was his anthropomorphic tendencies, but it appeared that the beast was actually going to heed Hasan. The lizard blinked twice, then turned about and waddled back into its cave. Hasan looked at the path ahead. “I don’t like the looks of that cave,” the elf said flatly, “but I remember hearing words before that we wouldn’t want to proceed leaving it unexplored. I suppose the same applies now. Still, the first thing will be to get there. Ludo, I suppose the honor is yours?” The elf’s head disappeared into the neck of his mail shirt as he pulled the old mail up. Hasan tucked his mail shirt into his backpack, to ease his movement during the climb down the canyon. Ludo carefully made his descent. Confident in his abilities, he took his time to ensure he found good hand and foot holds as he descends. Once at the bottom of the gorge, he took up a position near the entrance to the cave. Miklos followed next gingerly testing the rope before he descended, moving away for the base before anyone had a chance to fall on him. “Da,” Stephan nodded at Ludo and prepared the ropes as directed. He watched the rogue’s progress noting where the foot and hand holds were. All in all, Ludo made it look easy. Despite the woodsman’s idle concern, he quickly made to follow Ludo. “Best not leave the lad alone down there. Arrows and bolts at the ready please!” he made his enigmatic request of those in the party with distance weapons to cover he and Ludo while separated from the others. Alone for a couple minutes on the rock face, Stephan felt the crisp morning wind trying to send him swinging like the pendulum of the old time piece back at Sukiskyn Hall. Alighting at the bottom, he quickly drew his blade and checked the surroundings keeping close attention the on cave opening. Maruc looped the rope around his armoured frame and took the weight. He’d carefully watched Ludo lightly lower himself expertly with one to to seemingly insignificant touches with his feet. The reality was altogether different after just feet feet Maruc’s sore palms were burning against the course rope. While the others descended, Feldard had removed what armour he could and strapped that to his pack. It weighed heavily on his back but at least he could move somewhat. His turn was approaching far too soon. This was one of those moments when Feldard didn’t like being last. He knew all eyes would be on on him as he clambered down the wall. No easy task. At the bottom, the others watched as Maruc continued to make his descent. He awkwardly dangled in mid space rotating like a child’s mobile. There was little or no grace to his descent. The priest was about halfway down when, suddenly, from out of the dark cave-mouth came a disgusting lizard with pebble-colored olive skin. It was enormous, about 8 feet long. Large white spikes stood erect from its back. It stared stupidly for a moment before thundering to the attack. He carefully continued across the bridge and felt great relief upon reaching the other side. He moved well onto the mountain trail, away from the crumbling stonework of the bridge. Seeing his companions making their way over the bridge–save for Miklos, who flew with what the Traladaran thought was smugness–he came closer to lend a hand if needed. Feldard followed the griffons with his crossbow until they were well out of sight. He then turned to the others as they arrived safely on this side of the bridge. “Let’s keep moving, in case they change their mind or can’t find ‘easier prey’”. Feldard resumed his rearguard position as the party set off once more along the mountain path. Ludo breathed a sigh of relief and quickly moved on to get over the bridge. As he arrived at the other side, he waited to one side and watched the others make their way across. When they had all arrived safely he moved out following the path up higher into the mountains. The path wound higher and the chill deepened. “Time for a warmer robe.” he said. Furnished with his thickest garments he pressed on behind his companions. Eventually, they stopped to make camp for the night, which soon passed without incident. The next morning they departed and soon came upon another gorge. It too was once spanned by a bridge, but it was now collapsed. Fortunately, the sides of the gorge were rough and had many narrow ledges along them. At the bottom of the gorge, there was a dark cave-mouth leading into the rockface. Ludo looked on in shock and awe as the two magnificent creatures flew towards the bridge. His first instinct was to run, but he knew there would be no way he could out run these Griffons. Over the swirling wind he yelled “don’t run, stay together”. He quickly looped the end of the rope around under his arms and around his chest and tired a secure knot. Ludo figured that if the Griffons attacked and tried to carry him away he would it least stand a fighting chance of survival if his friends could hold onto him. He drew his sword and took up a defensive stance to meet any attack. Feldard, from the other side of the bridge, watched as the two avian creatures flew overhead towards the bridge and his companions. He readied his crossbow but at the moment they were well beyond its reach. Without realizing, he moved back out onto the bridge, watching the griffons approach and waited with held breath as he took aim. “Morndu!” Stephan called out. “They are nimble fliers,” he warned his comrades. He tried to meld into the stonework of the bridge–without letting go the rope–to make himself as small a target as possible. Even so, his sword was unsheathed and ready to fend off any attack. Hasan frowned as he saw the griffons speed forward. The party was separated and weak. He stayed on the high cliff wall and watched alone. The griffons were about 200 feet away but descending to within a longbow shot. The elf laid at his feet his longbow and the most precious arrow rescued from the hall of the goblin king. The elf was ready, but pacifistic. Maruc swept his traveler’s cloak back, revealing the vestments of a cleric of Halav. The dark young man grew in his boots as he inhaled a great gulp of the mountain’s cool air. “Well met, great allies,” the priest’s voice boomed out. “We venture in quest, for the glory of Halav. We shall not tarry long on these great heights, that suit you better than us. Take your leave and know that we journey to end the Son’s of Darkness own quest against our Lord, that we may glory our Lord and elevate his reign. Adieu.” Maruc’s cloak and sacred vestments billowed in the winds. The griffons heard the cleric’s words, but cared not. They were looking for food. Large mammals were best, but not humans, elves or dwarves. They had hoped the travelers would be on horseback, for equine meat was their favorite. The griffons continued their course, passing overhead. Their sharp caught sight of wild boar in the distance, that would do just fine.